PIERRE, S.D. – According to the South Dakota Game, Fish and Parks (GFP), this year’s pheasant brood survey shows a 47 percent increase over last year. 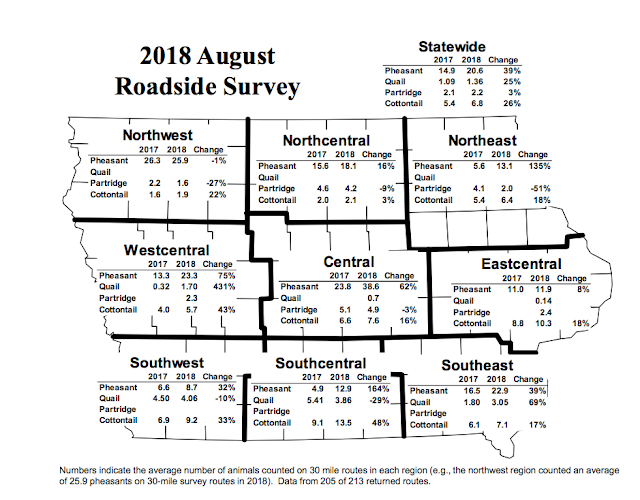 The 2018 statewide pheasants-per-mile (PPM) index is 2.47, up from the 2017 index of 1.68. From late July through mid-August, GFP surveyed 110, thirty-mile routes across the state’s pheasant range to estimate pheasant production and calculate the PPM index. The survey is not a population estimate, but rather compares the number of pheasants observed on the routes and establishes trend information. Statewide, 85 of the 110 survey routes had a higher PPM than 2017. “We are pleased to see pheasant numbers improve across the state; particularly in the far eastern part of the state where hunters will have more opportunities to harvest birds than in recent years,” stated Hepler. “The full report provides an overview of upland habitat; which remains a concern for all wildlife across the state. 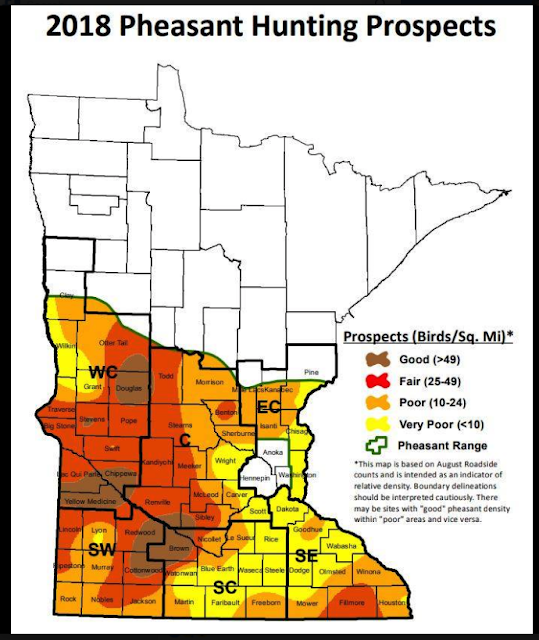 Just as changes in landscape-level habitat conditions have produced peaks and valleys in the pheasant population for 100 years, habitat will again be the key to preserving pheasant hunting for another century." The Walk-in Area (WIA) program added 39,000 new acres in addition to 8,000 new acres last year. With 1.1 million acres of public hunting land within the heart of South Dakota’s pheasant range, great opportunities remain for public access to pheasant hunting. Hepler said hunters should notice far fewer disturbed CRP fields compared to last year when emergency haying and grazing was authorized in response to severe drought conditions. The annual hunting atlas and a web-based interactive map of public lands and private lands leased for public hunting can be found at https://gfp.sd.gov/hunting-areas/. In addition to printed and interactive maps, hunters can utilize GPS downloads and smartphone applications to locate public hunting lands throughout the state. Hunters are again asked to hunt safely and ethically, respect private landowners and those public hunting areas scattered across the state. “Challenges exist to maintain habitat, desirable pheasant population levels, and to recruit a new generation of hunters to preserve this truly special sport of pheasant hunting. Take time this fall to celebrate the hunt, the sense of community and comradery while appreciating how deeply rooted the tradition of pheasant hunting has been for the last 100 years,” concluded Hepler. South Dakota’s traditional statewide pheasant hunting season opens on Saturday, Oct. 20, 2018, and runs through Jan. 6, 2019. AHO Season2: Episode 5 This Episode wraps up our six day pheasant hunting adventure that spanned across two states! We hunted hard for six days straight and made a lot of new friends! The state Game, Fish and Parks Department will conclude its pheasant brood survey on Wednesday. While the final report is not intended to be a true population estimate, many hunters view it that way. In fact, the report, which is traditionally unveiled around Labor Day weekend, is heralded as the “unofficial official” kickoff to pheasant season. But if you’ve waited until mid- to late August to kick off your pheasant season, you’re already a day late and a dollar short. If you wait around for a report to tell you how many roosters, hens and chicks wildlife officials record on predetermined routes before you make your hunting plans for this fall, you’re missing the point. No matter the year, a limit of pheasants never magically appears on your doorstep or hits your windshield as soon as you head out hunting. Success in the pheasant fields — just like in the deer stand or the duck blind — takes work, and the work should have already started. Regardless of which direction numbers are trending, pheasant hunting starts with a mindset. Wild birds are growing smarter and wilder each year, and if there are fewer birds on the landscape than last year, you’d better make up your mind that you’ll be ready to go the extra mile for your birds. To go the extra mile, your dog needs to be in tip-top hunting shape prior to the season’s opening bell. Temperatures will likely still be in the 70s and 80s at times in mid- to late October. An overweight, out-of-shape pet is exponentially more susceptible to heat stress than a properly conditioned gun dog. Too many hunters expect their dogs to be rock stars right out of the gate, even if the dogs have seen nothing but the inside of a kennel for the last nine months. With pheasant season only two months away, there’s still time to knock some rust off your dog prior to the season. If you plan on walking or running your dog in town this time of year to get it back in shape, remember that concrete sidewalks and asphalt roads can really heat up during a sunny day and can hurt or burn a dog’s pads. If you wouldn’t walk on it barefoot, then it’s too hot for your dog. If you run your dog in a cover, keep in mind that most types of cover actually trap heat and humidity. So, on an 80-degree day it’s likely going to feel more like 90 or 95 degrees to your dog as it meanders through the cover. In addition to walks and field work, even backyard sessions where simple obedience commands — sit, stay, heel, come, kennel — are reinforced and will start reprogramming your dog’s brain into performance mode. These are also ideal situations to get the entire family involved, as kids enjoy getting outside and helping train their dogs. Plus, it gives them an opportunity to see their house pet transform into a gun dog, doing what it was bred to do. Being in shape goes for pheasant hunters, too. Early season treks through even light cover can take their toll on an out-of-shape hunter’s lungs, joints and muscles, and it’s easy to forget how difficult it is to bust through heavy cover such as cattails and waist-deep CRP. Not being able to finish a walk or having to quit a hunt early because you or your dog are out of shape is completely avoidable, so start preparing now for the physical aspects of pheasant season. We were hosting the site with another provider and when we switched back to blogger we lost a couple of years worth of posts ( Probably user error ).